Google’s OnHub router is the easiest I’ve ever managed, and fast too, but the lack of control may bother advanced users. When Google announced a router with TP-Link, there was a bit of a frenzy over the resulting product, OnHub – and for good reason. The specs look impressive on paper, with a baker’s dozen antennas and a feature set that would make any rented cable company’s router shake in its housing. But it isn’t just the hardware that has users excited, it’s Google’s involvement in the project. The company’s contribution to OnHub comes in the form of Google’s On management software. The convenient smartphone app takes the complicated admin pages and port forwarding settings out of the equation, and translates it into real, understandable language. It’s a switch from traditionally daunting router admin panels, and a welcome one for most users. Still, at $199, the OnHub is anything but cheap, and it faces stiff competition at that price point from high-end gaming routers. Is Google’s attempt at Wi-Fi a flash in the pan, or the next big thing? Right when you pull it out of the box, you’ll notice the OnHub doesn’t look like any other router – as in there’s actually consideration behind its design besides “box with antennas.” An attractive matte navy shell surrounds the central column of the OnHub. User can twist and lift to reveal the ridged body of the router underneath. 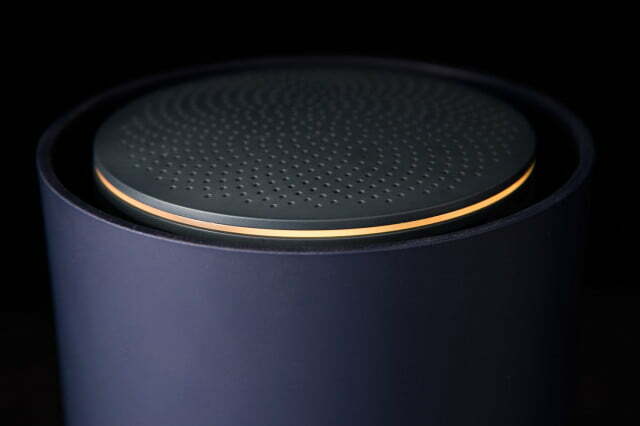 OnHub is simply the most attractive router I’ve seen – although that’s not saying much, as most look like dead spiders. 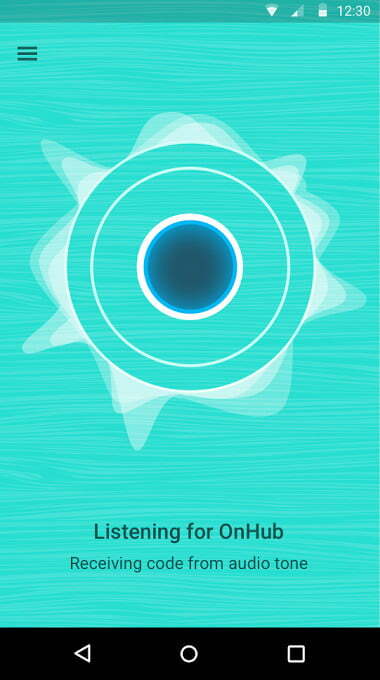 There are other benefits to OnHub’s smart, modern design. The first is that it places all of the antennas in a circle around the outside of the device. If you’ve ever wrangled with the antennas on your router trying to maximize your signal strength, you’ll appreciate the new layout, which doesn’t require any tinkering. The second reason for the design change is more dubious. Google thinks that if your router doesn’t look like someone tried to stab a cigar box with plastic carrots, you won’t mind placing it more centrally. While the OnHub is attractive enough to sit on your kitchen table, that’s not exactly practical. You still have to place the OnHub close enough to your modem to connect it with an Ethernet cable, and you have to plug it into a wall. Still, the cool exterior will help move your router from behind your entertainment center – to the top of it. 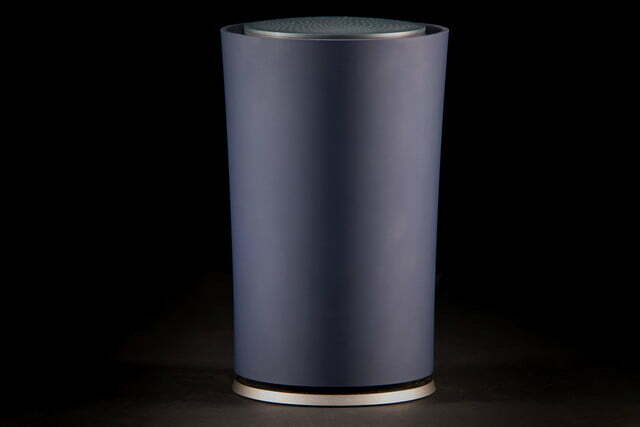 In terms of wired connectivity, the OnHub keeps it simple. At the base of the device, tucked neatly underneath the shell with a passage for cables, you’ll find power, USB, and a pair of Ethernet ports – one in, one out. Google’s On software is clearly what sets it apart from other high-end routers. That’s a few short of the four LAN ports we’re used to seeing on routers, but Google and TPLink apparently think one is enough, and we’re inclined to agree, especially with the low costs of switches if you need more. Of course, the OnHub is a wireless router, and that’s where the capabilities really shine. 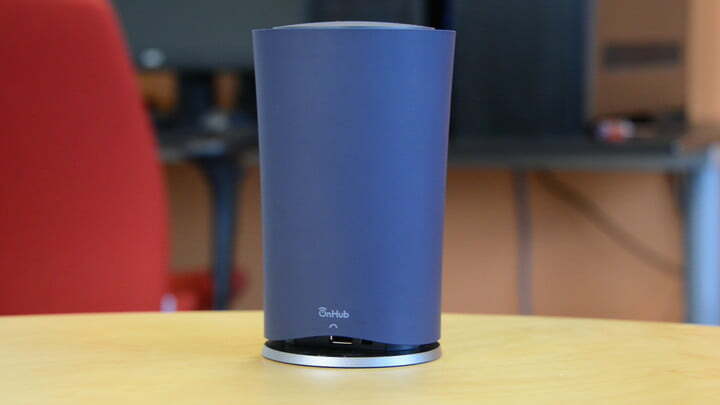 Of the thirteen Wi-Fi antennas in the OnHub, six are for 2.4GHz, six are for 5GHz, and one is a dedicated listening antenna that keeps track of interference from other devices and networks. The interference antenna makes a big difference, and honestly should be a feature in most routers. As it turns out, apart from the circular design, the hardware features on the OnHub aren’t particularly powerful for the price range. 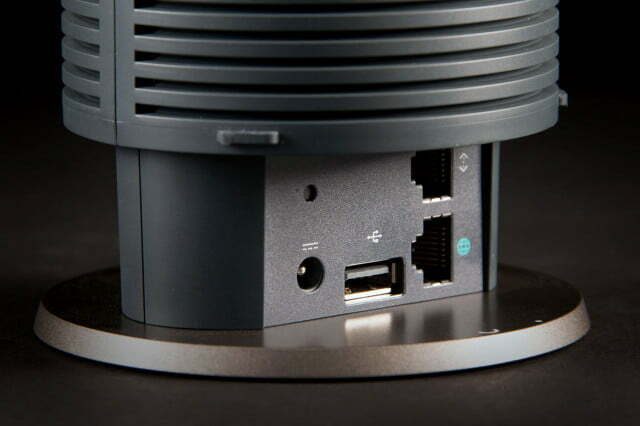 What really sets apart the OnHub from other routers is the firmware and software suite, as provided by Google On. Having worked in IT, I’ve set up dozens of routers from every major manufacturer, as well as handled installation and management of DD-WRT, so I’m no stranger to a good admin panel. OnHub is by far the easiest and smoothest installation I’ve ever encountered. The app leads you, step by step, through each piece of the process. Join the default network printed on the router, answer some easy questions, set an SSID and password, reconnect to your new network, and you’re off and rolling. But the fun doesn’t stop there. Once the network is set up, it pokes around through the connected devices to figure out where it exists in your configuration. OnHub was quick to mention that the security router that Comcast had installed wasn’t in bridge mode, and OnHub was creating a double NAT. It resolved the issue by putting itself into bridge mode, but also let me know that wasn’t the best option. OnHub is by far the easiest and smoothest installation I’ve ever encountered. 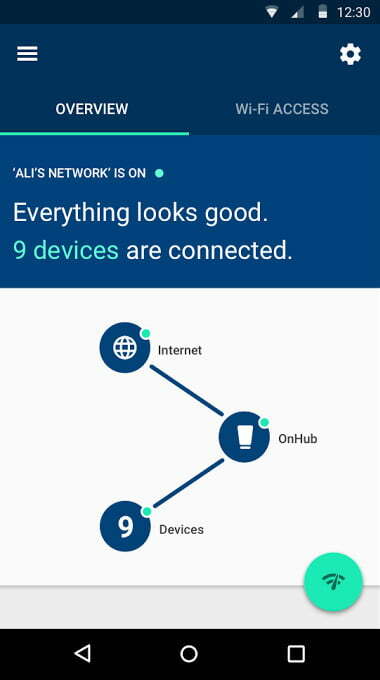 If nothing is wrong with your network, the On software will happily report back that “Everything is great” and let you know how many devices are connected. 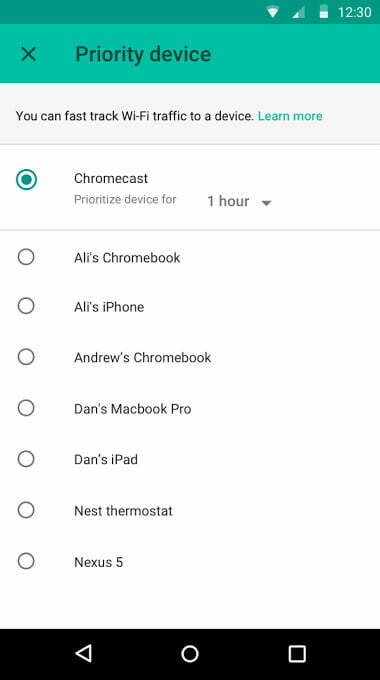 You can view all of the devices that are currently connected, and view their data usage in real time, or over the last hour, week, or month. From this menu, you can also set a preferred device, which will prioritize bandwidth to it for a set amount of time, or forever. A quick Wi-Fi scan of my home network verified that dynamic channel switching had at least happened once. I happen to know the neighbors on both sides of my house are on channel 1, and the house behind is channel 6. The first time I checked OnHub’s channel, it was set to 11. Plugging it in at the Digital Trends office caused a bit of chaos at first, but ultimately the OnHub navigated the crowded office building’s Wi-Fi frequencies and settled on channel 8, where it had by far the strongest signal. It’s still not an ideal setup for advanced users, who will want more from their administration panel. Port forwarding and DNS settings are accessible, but Google On takes a bit of the control out of your hands in exchange for a cleaner interface. 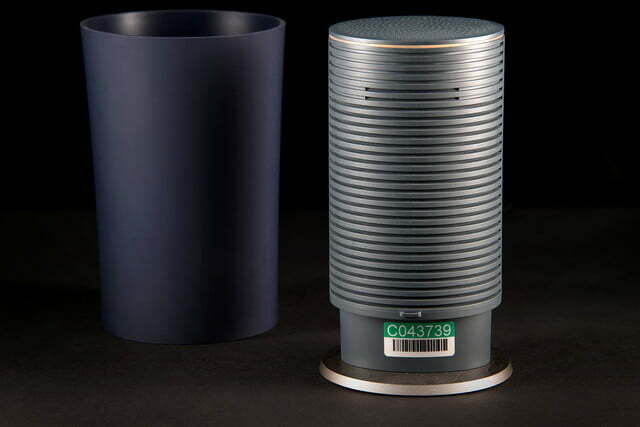 Outside of Google On’s built-in test, our options for evaluating the speed and strength of the OnHub are limited. Normally the admin panel of DD-WRT would key us into elements of our current connection like the signal to noise ratio, throughput, and packet loss. Unfortunately, On’s admin panel doesn’t include a lot of this information, although the built-in benchmark is a good one. In order to find out if the OnHub can hold its own, it needs to be put through its paces. Fortunately, my house makes a perfect torture test for any wireless router. The two-story home I share with four roommates was built in 1908, and has lathe and plaster walls, which are notoriously difficult for Wi-Fi signals. Between the five of us, there are at least 15 total devices connected to the network at peak times, including laptops, desktops, streaming devices, and smartphones. When everyone is home and trying to stream movies and video chat with friends, our network frequently buckles under the pressure. Between the dropped packets and limited bandwidth, online gaming becomes near impossible in the later evening. In an anecdotal capacity, the OnHub cleared up a lot of those issues immediately. Even while several roommates were watching different movies on Netflix, I was able to continue playing Heroes of the Storm with no issue. My roommates were similarly impressed, noting that Wi-Fi speeds and signal strength were better in all parts of the house after installing OnHub. We also noticed a slight bump in our download and upload speeds, just over two megabytes per second download and .8 upload better than before. The improved bandwidth was less noticeable than the router’s improved signal strength and lower packet loss, however. Google’s first venture into wireless networking with TP-Link is a success, but the target demographic is clear. If the thought of accessing your router’s admin panel makes your eyes gloss over, or you don’t have a password on your network because you don’t know how, the OnHub is definitely for you. Setup is clearly explained step by step, and the OnHub reports back on its status in clear, easy to understand terms. Renting a modem is a waste of money. Save some by buying your own modem. If you do need more than one Ethernet port, this 8-port switch is cheap and will solve that problem. Take advantage of 5GHz Wi-Fi with an expanded USB network adapter. That’s not to say users who are already expert home network administrators won’t find the Google On app useful. 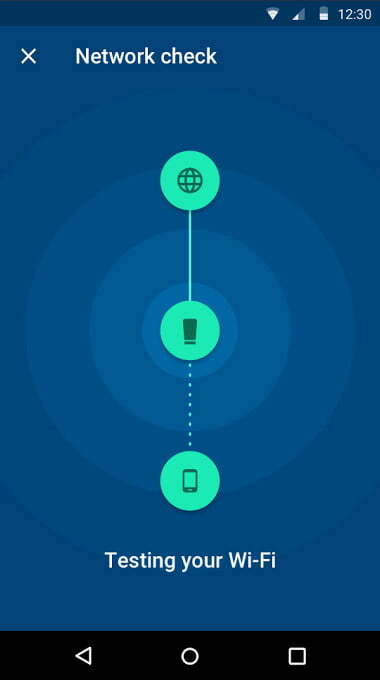 Being able to run a network test from the sandbox environment of your phone helps you identify issues and find optimum placement quickly, without having to walk around the house with a laptop. Google’s On software is clearly what sets it apart from other routers in its tax bracket. The hardware options are very similar in the $150-200 range, like the Netgear Nighthawk AC1900, or even TP-Link’s own Archer C3200. They boast multiple or dynamic channel switching, 1900Mbps speeds, and anywhere between 3 and 6 antennas, plus device prioritization and advanced security settings, although they’re bit tougher to get to. 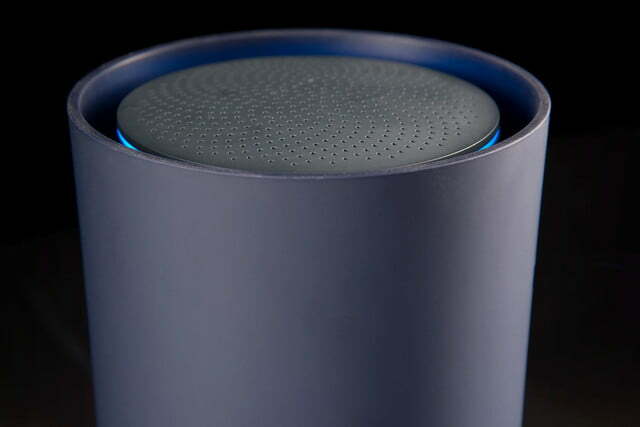 Ultimately, the OnHub is designed to put Google On squarely in control of your network. That’s not a bad thing, considering the automatic security and channel settings are better than most users will ever set theirs to. Advanced users will find network administration tools to keep themselves and their housemates happy, as well, although not as many as when they had to roll up their sleeves and take a wrench to the admin panel.